Spend 2 Saturdays with us and make an awesome pair of summer pants or shorts! Views A and B have a mid rise that sits just below the natural waist. Views C and D have a high rise that sits over the belly button. All views have front pleats and side pockets. 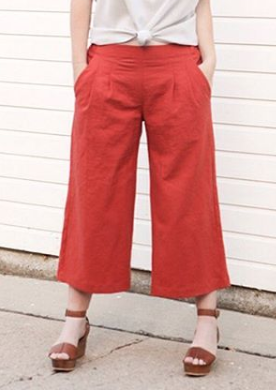 Views A and C are a cropped, wide leg pant, hitting a couple of inches above the ankle. Views B and D are a short with an approximate 4 inch inseam.